Discussion in 'Hedgehog Colors' started by Patrick, Jun 17, 2014. Give as much info as you have/know so we can put together a comprehensive list made up of members hedgehogs! 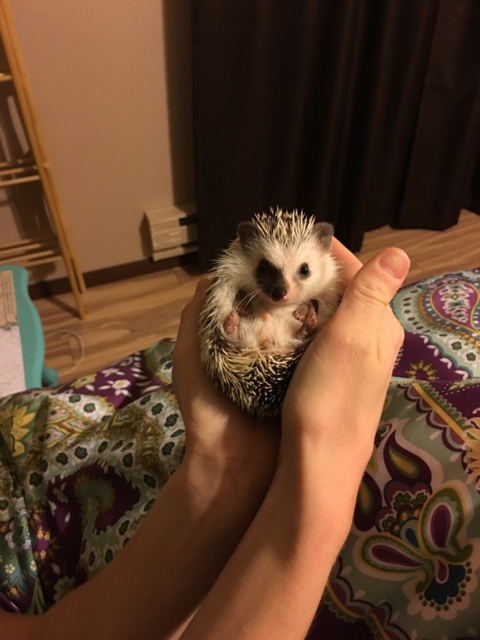 If you're not sure what color your hedgie is, post a picture so others can help identify him/her. Susan and Josh like this. This is Zoey, a Salt N' Pepper, Overo face/pinto face, Heterochromia eye hedgehog. She is quite special, if you see close enough, she has two different colored eyes which is very rare. Abdulla, milkandsam, ellisrks01 and 2 others like this. Wow. She's very pretty! That nose! How old is she there? Wow, great specifics! The more details the better for folks to use this as a resource. Thanks @Susan! This is a white-bellied standard Grey color. it's a pretty common color. Esther Marie Pearce and Patrick like this. I'm told Phyllis is a reverse pinto cinnacot. Olive is a Chocolate Algerian. She shows all the characteristics except mottled belly, but her legs have the different colors and are mottled. She is larger, has bigger ears, a perfect long teardrop shaped face and all other characteristics, like her quills that aren't banded, are cream instead of white, the bands on her quills between the darker color, are creamish brown, she has very distinctive cheek and eye patches as you can see in the picture, her skin below her quills is a lot darker than her quill color, it is a very dark grey almost black color. And she is quite a bit bigger than a lot of hedgehogs I have seen. She weighs in at 505 grams which is also her most ideal weight. She can only use a 12' wheel she is so big. She does have a patch of almost white quills on her side, but the skin underneath them isn't pink otherwise she would be a pinto. 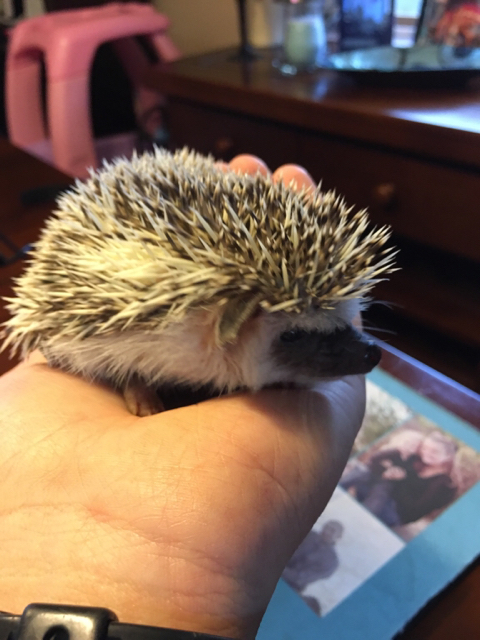 Pinto's have different colored patches of quills and skin. If the skin below her patch of lighter quills was pink or lighter she would indeed be a pinto. The long, double-banded quills on the forehead are very helpful. If there is good, clean separation between the two bands, the hedgehog is in the White-Bellied colour grouping. If there is poor separation with a fair degree of colour or muddiness between the bands, then the colour is in the Algerian grouping. Although the differences between mask colours in the two species is difficult to differentiate in colours in the Apricot to Algerian Chocolate range, (Algerian masks are somewhat lighter and more of a brownish tinge) they are very easy to distinguish in the Algerian Grey to Black range. The masks in these colours are considerably darker and extend well past the eye, almost to the point where the face meets the quill line at the side of the face. As well, many display "badger stripes," two stripes that extend from the mask, up the forehead between the eyes, to the quill line. Mottling of the skin on the underbelly (similar to birth marks) is another good indicator. While White-Bellied Salt & Pepper, Dark Grey and Grey (and their associated variants) can and oftentimes do have mottling, all other White-Bellied colours do not. All Algerian colours, on the other hand, can display mottling to some degree. A Cinnicot with mottling, for example, must be an Algerian Cinnicot. Eye patches are a very distinctive marking seen only in Algerian colours and the odd W.B.Champagne/Cinnicot. These are pale golden-brown patches of colour located just below the eye. They range in intensity from very pale and small in Algerian Champagne to a rich golden-brown and as much as 3/8 inch in diameter in the darker Algerian colours. Great details everyone! This is wonderful for folks looking for information about hedgehogs. This is my Female Hedgie Sonic. Not sure what colour she is. Got her for about three days now. Sonic looks to be a gray or dark gray to me. Very cute girl! This is Kea, a Salt'n'Pepper Pinto. I think she is white-bellied. And now I'd like to introduce my little Pale Apricot Snowflake, Lumi. She has Ruby Eyes. With her I have to admit that I am not half sure about Snowflake, she could also be an Pale Apricot White, since there are so many white quills. But the former color was the one given to me by my breeder. Beautiful hedgehogs. You've got a lovely array there. Great pictures of Kea and Lumi's coloring! This is Purgy. I don't know exactly what type he is but I thought his face was really cool and cute.